Infiniti's Q50 is the compact luxury car that replaced the old G-series sedan a few years back. It has since become Infiniti’s best-selling model in the North American market, representing a worthy alternative to luxury favorites like the BMW 3 Series and Mercedes-Benz C-Class. It’s actually larger in dimension than those two rivals (though it has a similar purchase price), but still smaller than cars like the upmarket BMW 5 Series. Minor cosmetic changes are on the table for 2017, as this is still a fairly new model, including a chromed surround for the grille. There are also six trim levels and three gasoline engines available, as well as a separate Q50 Hybrid model. Powering the base Q50 is a 2.0-liter four that makes 208 hp and 258 lb-ft of torque. The next move up in power is a big one, to a 3.0-liter twin-turbo V6 that makes 300 hp and 295 lb-ft of torque. That same engine can also be had on the Red Sport trim, with a more aggressive tune that makes 400 hp and 350 lb-ft of torque. Nissan’s 6-cylinder engines generally sound fantastic, and the powerplants in the Q50 are no exception. While technically a luxury car, it still snarls and howls under hard acceleration. Infiniti doesn’t have a dedicated sports model like the BMW M, but its 400-hp V6 has more than enough grunt to play around with just about anywhere but on the track. While the Q50 hybrid has really impressive fuel-economy figures, the conventional Q50 range isn’t so great--though it isn’t exactly bad, either. The base 2.0 trim gets just 23 mpg city/26 highway, while the 300-hp V6 gets 20/30 and the 400-hp V6 just 20/22. Those figures are all for standard rear-wheel-drive trims; adding all-wheel drive will drop the figures by a point or two. The 2017 model year brings some tweaks to the steering, but the Q50 is still available with the Dynamic Digital Suspension system that comes on some V6 trims, which adjusts the stiffness of the dampers according to the driving mode selected. Direct Adaptive Steering, an electronically assisted variable-ratio power steering system, has also been reportedly improved. More than 300 settings are available in the Drive Mode Selector, which adjusts things like engine, transmission settings, power steering, and stability control. Sport and Red Sport models, in addition to the Digital Dynamic Suspension, come with 19-inch wheels, leather sport seats, magnesium shift paddles, and aluminum pedals. An available Premium Plus package adds convenience features like auto-dimming mirrors, heated front seats, a heated steering wheel, and navigation. The Driver Assistance package, meanwhile, adds automatic wipers and safety features like blind-spot monitoring and collision warning. Dual-zone climate control, 8-way power seats, a leather-wrapped steering wheel, and two USB ports come standard; two central touchscreens house most of the cockpit controls. Trunk space is a decent 13.5 cubic feet and rear seat room is adequate. Up front, available sport seats offer more support and adjustments. In general, fit and finish compares well with the other cars in the segment. The Q50 has an impressive suite of state-of-the-art safety features, including moving-object detection, adaptive headlights, blind-spot intervention, lane-departure warning and prevention, active lane control, and backup collision intervention with rear cross-traffic alert. There is also a forward collision warning system with emergency braking that can read up to two cars ahead. Most of these features are included in the technology or driver assistance packages. The current Q50 has earned the coveted Top Safety Pick+ status from the Insurance Institute for Highway Safety and a 5-star overall safety rating from the National Highway Traffic Safety Administration. The Q50’s steady improvement has made it an ever-more-tempting offering, but the car still faces some serious competition, from established German players like the BMW 3 Series and Mercedes-Benz C-Class to other models like the Cadillac ATS and Acura TLX. Though a worthwhile choice, it's still not a standout. 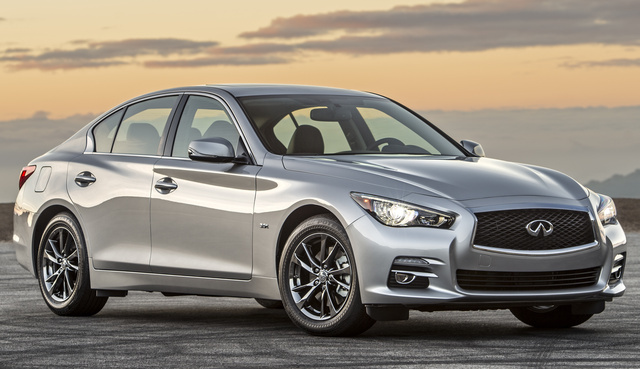 What's your take on the 2017 INFINITI Q50? Users ranked 2017 INFINITI Q50 against other cars which they drove/owned. Each ranking was based on 9 categories. Here is the summary of top rankings. Have you driven a 2017 INFINITI Q50?